Leading ambulance vehicle manufacturers in India have been focusing on making their vehicles more reliable and user friendly, and incorporating the highest levels of safety and sophistication into these vehicles. 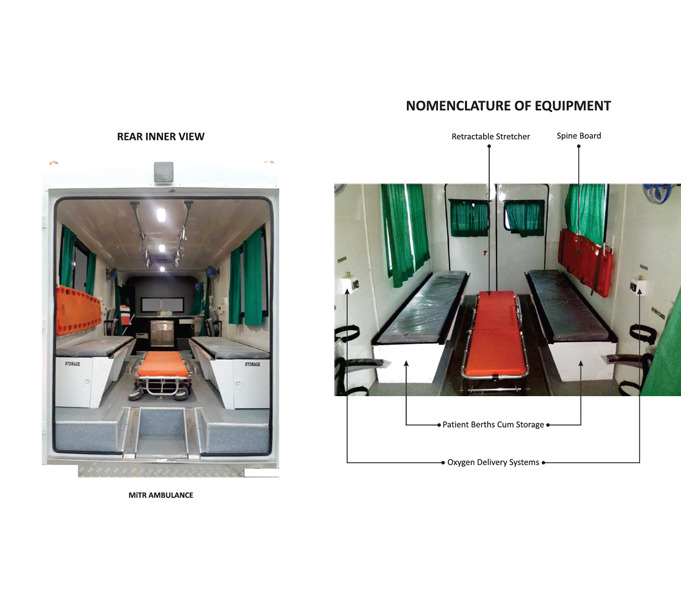 In this article, we explore the MiTR ambulance, a special product of JCBL Limited, a leading ambulance manufacturer in India, well-known for its product line named “Hospital on Wheels” and other brilliant, customized solutions. 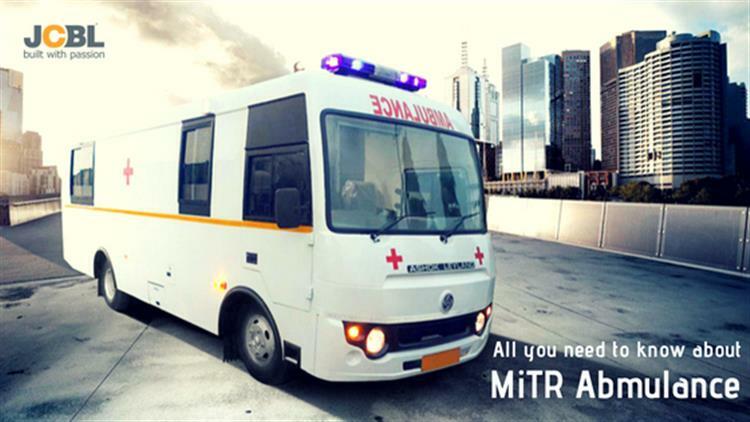 The MiTR ambulance is a specially equipped vehicle designed for transportation of sick or injured people to, from or between places for treatment. This vehicle has been designed to deliver best-in-class treatment, attention, and ensure safe, well-handled transport for patients. Ready to see how this smart ambulance looks like and what its features are? Let’s get started, shall we? A star feature of the MiTR ambulance, the Retractable Stretcher is extremely light weight and easy to use and handle. What makes this stretcher so reliable? This stretcher is well-equipped to transport a patient from the pick-up location to the hospital bed in a hassle-free manner. With mechanical folding legs, rollers, manual wheel brakes and a safety locking system, these stretchers provide wonderful navigability for emergencies. A flexible, high-strength aluminium steel frame that is easily sterilizable, and a durable foamed cushion bed with an adjustable backrest make these stretchers versatile, comfortable and ideal for an ambulance unit. Another well-placed feature is the comfortable seating arrangement included. 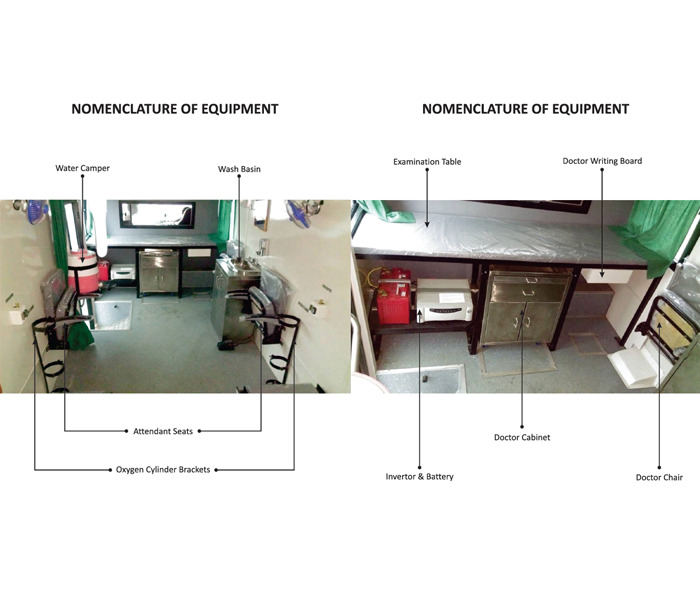 The ambulance has two comfortable patient berths on either side, with intelligently added storage units below them. These patient berths are well-fabricated, made up of cushioned memory foam and are comfortable and spacious to sit or lie down. Each storage area under the patient berth is equipped with a double fold Canvas stretcher. These highly useful stretchers are most useful during emergencies like road injuries, sport and ground injuries etc. What makes these canvas stretchers so popular, you ask? Their versatility, easy double fold structure, sturdy design and compact storage add convenience and comfort during handling, making them a top choice for an ambulance add-on. JCBL makes highly durable top quality canvas stretchers for its ambulances, with frames made of high strength alloy and a special ergonomic design for better grip and handling. This is another brilliant addition to the MiTR Ambulance unit. Extremely handy while transporting patients with delicate, spinal injuries, these boards offer just in time support and rigidity. Spinal injuries most often require immobilization, rigid support and minimal movement to prevent further complications during transit. The spine board included in the MiTR ambulance delivers the right amount of immobilization, support and rigidity to patients, making this a highly valued addition for patients with spine injuries. What’s more? These boards are long-lasting, durable and made from high quality materials. Also added are safety belts for extra grip and lock down. The importance of oxygen delivery systems cannot be emphasized enough for patients with asthma and COPD. These life-saving systems are equipped in the MiTR ambulances to help with the necessary, primary care of the patient during his transit to the hospital. MiTR ambulances incorporate two oxygen delivery systems as a principal part of the routine care of patients. Another highly useful addition in the MiTR ambulance is the presence of an inverter. Used to convert direct current (DC) to alternating current (AC), the ambulance has two AC sockets in the patient cabin. The inverter is equipped to deliver an AC supply for 25 minutes when the vehicle engine is off. The MiTR ambulance is equipped with a great Public Address system. Comprising of a microphone, an amplifier and a loudspeaker, this system is added to the driver’s cabin, offering good means to allow the officer or driver to address the public. A well-built siren with bar light and flashers helps in yielding “Right of the way” so that the ambulance may proceed unimpeded. Don’t you think that the public address system and emergency siren, are both great ways to provide visual warning and convey urgency to other vehicles on the road? A wonderful feature of the MiTR ambulance is the presence of a separate doctor’s examination corner. This helps in on the go diagnosis and primary treatment, thus simplifying and speeding up the patient’s treatment procedure. The doctor’s examination space can be easily accessed through a side door, and comprises of an easy chair, an examination table, and a cabinet for storing the necessary doctor’s supplies. Interesting: What Wikipedia Can't Tell You About SAVs? Apart from this, the unit also has a writing board and a window in common with the driver’s cabin for communication if necessary. If these features were not enough to make you go wow, here are some additional features the MiTR is equipped with. The smart ambulance comes complete with a water camper, and a brilliantly devised wash basin. This wash basin runs on the operation of a foot pedal that runs on AC, and has well-built tanks to store fresh and used water. Other safety add-ons include a first aid kit in the driver’s cabin equipped with basic first aid items like bandage, cotton, antiseptic liquid etc. and a fire extinguisher to keep handy for fire hazards in the ambulance. Apart from these, there are 4 wall fans and night lamps included for extra convenience and comfort. Pretty cool features, aren’t they? We hope you enjoyed this blog on the ingenious MiTR ambulances from JCBL. Let’s hope that in the future, every ambulance in India is equipped with similar state-of-art technologies and equipment. Innovations like these will surely strengthen our beliefs in modern medicine and its immense ability to simplify and deliver value to a common man’s life. What do you think? Share your openion with us in comment section below. JCBL Ltd: Thanks Raman. We value your feedback. JCBL Ltd: Thanks Ravi for your query. Our representative will get back to you.